TRC #267: Supervised Injection Sites + Who Owns The Future + Are Refrigerators Death Traps? Episode 267 is here! First the gang is joined by Dina Tsirlin who explores supervised injection sites such as Insight in Vancouver. Next the panel has a heated discussion about the book “Who Owns The Future” by Jaron Lanier. 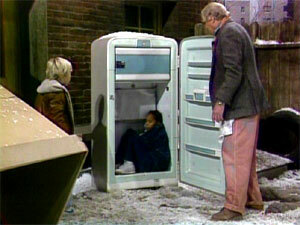 Finally, Adam examines an episode of Punky Brewster and asks: are refrigerators death traps? This entry was posted in The Reality Check Episodes and tagged 267, death, future, injection, owns, refrigerators, sites, supervised, traps, trc. Bookmark the permalink. 12 Responses to TRC #267: Supervised Injection Sites + Who Owns The Future + Are Refrigerators Death Traps? I liked the discussion on “Who Owns the Future.” For those interested, they might want to check out http://newworknewculture.com/ . Frithjof Bergmann has advised many governments on the coming work crisis, a crisis you seemed to be talking about on this podcast. His thoughts are interesting. In one sense he agrees the thesis of “Who Owns the future. He thinks that technology is reducing the amount of work available for everyone. His answer is to reduce the work week. There is much more but I thought I would just give a brief direction with which to come at his website. Thanks, Shane. I’ll check it out! I remember talking to my grandfather about this exact same thing. Back in the day (1930’s i guess), they had a fear that with all the machines to do the work of men that there was going to be too many idle people and that crime would spike as “idle hands are the Devils workshop”. People become computer programmers instead of buggy whip makers etc.. The assumption that if people cant do the exact same job they are doing today for generations into the future will result in them having nothing to do is naive and shows a fundamental misunderstanding of markets and economics. Things morph and change all by themselves. There may be some short term pain but things always adapt. They just do. The worst thing we could do is to do “something”, leave it alone and it will adjust automatically. If you were trapped on a desert island with 100 other people and all of a sudden you had a net and one guy could catch the same number of fish as 10 in the same amount of time using spears, you would see that for the true positive thing that it was. You wouldn’t worry about what they were going to do instead. You would realize that now we can improve the roof that leaks, we can build a better boat. We will all be better off. That’s how an economy works. Thanks for addressing my question about Supervised Injection. Harm Reduction is an area I would like to see more skeptics look into, especially for those that like to focus on science-based medicine or policy issues. You’re most welcome. Please let us know if you think there is another good topic/example out there. I really enjoyed the book club segment, I hope you do it again. My backlog of unread books is out of control right now and I wasn’t able to read Lanier’s book before the episode, but I wanted to say that I still really enjoyed the discussion. I think the fact that there was areas of disagreement made it really interesting to listen to, Pat and Darren in particular both made some good points. Given the positive feedback we are considering that; it’s great you enjoyed the discussion. Thanks for listening. Loved the lively discussion on Who Owns the Future. It’s great to hear reasoned debate in a forum where each side actually listens to the comments of the others before making a contribution. It’s also nice to know that the show is not simply an echo chamber, but a promoter of discussion. Interesting discussion on who owns the future. One of the comments made sparked off an interesting train of thought that I have contemplated before. Someone was talking about transport and would self driving vehicles kill off transport worker jobs on the presumption that this was implemented across the board. One of the consistent memes that comes up when people start thinking about what we will be doing or buying or driving in the future is that ‘everyone’ will be doing it. Ie we will all have self driving cars etc. Like in the movie Surrogates, where everyone had an avatar they used while staying in their home. The trouble is the world is full of poor people who simply could not afford these new technologies both in the increasing wealth gap in western countries and the third world masses. There is no way that a single revolutionary automation technology can be implemented across the board rapidly enough for there to be that sort of homogeny. Hell there are plenty of people now who don’t yet own a computer or use the internet. So I guess even as these paradigm changing technologies are introduced systems need to be duplicated for many decades while the costs come down and the low income masses ‘catch up’. The other comment about whether job losses are an issue – we don’t know what we don’t know. New industries are burgeoning now that didn’t existing 20 yrs ago (think environmental sustainability, energy tech). What new industries are we going to have 50 years from now (that we can’t predict) that will pick up the jobs lost from more automated industries? Also it is a virtual certainty that the worlds population will level off then start reducing all the while ageing in which case these automation systems are going to be essential to keep growth going and business thriving in the face of a shrinking pool of ‘working class’ people. I think this is an excellent point. How it would play out is complicated and uncertain. We know that for some technologies, like the phone, instead of putting in the power lines, many developed countries just skipped to cell phones. I still stand by being concerned about how things will play out, given there is a possibility it could go badly. It could be that there are jobs, but people might not want to do them (example: US citizens who don’t want to work in fields so migrant workers fill that gap). We also know Japan will prefer to have robots look after their elderly than import foreign workers. There are pros and cons to everything, eh? Fascinating points from the book about the societal harm done by innovation by removing jobs. Yes, I do agree, nanopayments to compensate for the business lost to innovation are the way. In fact, every time somebody wants a message sent to more than four people, the Town Crier’s Guild should get its nanopayment kickback. Every time a car gets produced, the saddlemakers should be compensated, for that could have been a horse requiring their saddle. And a percentage of every sale of a pill should be distributed directly to your local herbalists, shamen and medicine men. And oh yeah, let’s not forget that every time somebody takes a taxi, part of the fare should go to the coffers of rickshaw drivers union. It’s only fair and makes sense. Somehow. Some things just get obsolete. Paying for artificial life support for them doing nothing because that nothing is supposedly a “job” is so incredibly bassawckwards. Innovation means that new things will arise, including jobs, and ones that we don’t know about yet. And IF that doesn’t happen, IF… then we can just tax these hyperefficient solutions and use the deluge of resources that would net us to improve lives anyway, without having to support obsolete sinecures grandfathered in for everyone. This sort of doom-mongering is something I personally find extremely shrugworthy.